Esophageal squamous cell cancer (ESCC) is a high incidence and mortality disease worldwide. However, specificity and sensitivity of its diagnostic and prognostic biomarkers are still unsatisfactory. Recently, circular RNAs (circRNAs) as biomarkers have been studied extensively while the expression profile and clinical significance of circRNAs in ESCC have rarely been studied. We performed circular RNA microarray in 3 pairs of ESCC frozen tumor and non-tumor tissues to identify ESCC-related circRNAs and found 1045 up-regulated and 1032 down-regulated circRNAs among which 6 circRNAs (hsa_circ_0062459, hsa_circ_0076535, hsa_circ_0072215, hsa_circ_0042261, hsa_circ_0001946, and hsa_circ_0043603) displayed consistency with microarray results by qRT-PCR. 3 circRNAs (hsa_circ_0062459, hsa_circ_0001946, and hsa_circ_0043603) were also detected in plasma and 2 of them except hsa_circ_0062459 could be used as diagnostic biomarkers and found in exosome of cell-conditioned culture conditioned media. The AUC, sensitivity and specificity of hsa_circ_0001946 were 0.894, 92, 80%, of hsa_circ_0043603 were 0.836, 64, 92% while a signature combining them were 0.928, 84 and 98%. Hsa_circ_0001946 was confirmed to predict the recurrence, overall survival (OS) and disease-free survival (DFS) in frozen and FFPE tissues, while its overexpression decreased cell proliferation, migration, and invasion. Esophageal cancer (EC) is a common cancer type with high incidence and mortality rate, which is characterized by the international variance of incidence rate and pathologic patterns . The highest incidence rates are found in Eastern Asia and in Eastern and Southern Africa, while 90% of cases were ESCC in this area . However, its diagnosis and prognostic prediction confronted the following three challenges: the late appearance of symptoms, cost or uncomforting of endoscopy, the insensitivity, and non-specificity of biomarkers . Therefore, new sensitive and cost-effective biomarkers for ESCC diagnosis and prognosis are urgently needed. CircRNAs are could be free from RNA exonuclease and exhibits higher stability than messenger or linear noncoding (NC) RNA . Additionally, circRNA not only exists intracellular space but also could export into extracellular space . This trait made it possible to utilize blood as biomarkers detecting samples, which is an less invasive method. What’s more, circRNAs were verified to express by specific cell types or in particular pathological conditions . Several circRNAs were confirmed as diagnostic or prognostic biomarkers in cancer, including glioma , lung cancer , and laryngeal squamous cell carcinomas  etc. However, the usage of circRNAs as biomarkers in ESCC is still lack of exploration. Hence, we performed a prospective study (from Sep 2016 to May 2018) to find potential circRNA biomarkers, which was composed of four parts (Additional file 1: Figure S1). We demonstrated that circRNAs could be used for ECSS diagnosis or prognostic prediction and as promising targets for ESCC treatment. We conducted high-throughput human circRNA microarray to assess the differences of circRNA expression profiles between ESCC frozen tumor and non-tumor tissues(Additional file 2: Figure S2).To verify the results of microarray and identify the most possible clinical biomarkers, we ranked up-regulated and down-regulated DE circRNAs respectively according to fold changes, P value, processed signal value and the number of miRNA-responsive elements (MREs). 8 circRNAs were picked (Additional file 3: Table S1) and 6 circRNAs (hsa_circ_0062459, hsa_circ_0076535, hsa_circ_0072215, hsa_circ_0042261, hsa_circ_0001946, and hsa_circ_0043603) were consistent with the microarray result by qRT-PCR in another 10 pairs of tissues (Additional file 4: Figure S3). Then we expanded sample size to 50 pairs to measure the expression level of these 6 DE circRNAs (Additional file 5: Figure S4) and explore their relationship with clinicopathological characteristics of ESCC patients (Additional file 6: Table S2). Since blood is the most commonly used sample in laboratory medicine and blood test is a less invasive method in clinical medicine, we decided to found circRNAs secreted to blood among these 6 ones mentioned above and assessed their value as diagnostic biomarkers. It was shown that hsa_circ_0042261, hsa_circ_0072215, and hsa_circ_0076535 were neither found in patients’ nor healthy people’s plasma and serum but existed in both frozen tumor and non-tumor tissues (Additional file 7: Table S3). Then, another 50 pre-operative plasma from patients diagnosed as ESCC by pathological findings were collected while 50 plasma from healthy people were gathered as control. Levels of hsa_circ_0001946, hsa_circ_0043603, and hsa_circ_0062459 were detected in these samples. We found that expression levels of hsa_circ_0001946 (Fig. 1a) and hsa_circ_0062459 (Fig. 1b) in pre-operative plasma were lower than that in healthy people but hsa_circ_0043603 (Fig. 1c) was of no significance. The results indicated that these 2 circRNAs could be used as diagnostic biomarkers. Then the sensitivity and specificity were evaluated by ROC curve analysis. As the results showed, the AUCs of hsa_circ_0001946 and hsa_circ_0062459 were 0.894(sensitivity: 92%, specificity: 80%) and 0.836(sensitivity: 64%, specificity: 92%) respectively. What’s more, we performed a logistic regression to establish circRNAs signature by combining these two circRNAs expression levels in plasma. The formula is 3.272-(0.465*level of hsa_circ_0001946) – (1.706* level of hsa_circ_0062459). The performance was also evaluated by ROC curve analysis. The logistic regression model provided a better diagnostic accuracy, with the AUC, sensitivity, and specificity of 0.928, 84 and 98%, respectively (Fig. 1d). Then the relationship of these 2 circRNAs with clinicopathological characteristics of ESCC was also further studied (Additional file 8: Table S4). Since hsa_circ_0001946 and hsa_circ_0043603 may be potential diagnostic biomarkers, we then explored the origin of circRNAs in plasma. We used cultured cell model and collected the CCM to isolate exosomes. The copy number differences of hsa_circ_0001946 and hsa_circ_0043603 in esophageal epithelial cells and ESCC cells as well as the copy number changes along with time were studied. We found that expression levels of hsa_circ_0001946 and hsa_circ_0043603 in exosomes differed in esophageal epithelial cells and ESCC cells and the difference increased in a time-dependent manner (Fig. 1e and Fig. 1f). This inferred that both esophageal epithelial cells and ESCC cells secreted circRNAs by exosomes, which explained the detectable circRNAs in patients’ plasma to some extent. As Additional file 6: Table S2 showed, hsa_circ_0001946 was the only one associated with the recurrence rate of ESCC patients. As for disease-free survival (DFS) and overall survival (OS) prediction, patients in the high hsa_circ_0001946 group (according to the median level) had a much shorter DFS and OS (Fig. 2a and Fig. 2e), whose hazard ratio (HR) and 95% confidence interval (CI) were 0.357(0.164–0.781) and 0.209(0.076–0.579) respectively. Furthermore, we used FFPE tissues to verify this conclusion. The results showed that high hsa_circ_0001946 was associated with shorter DFS and OS in K-M curves (Fig. 2b and Fig. 2f) while univariate Cox proportional hazard models showed that expression of hsa_circ_0001946 in FFPE tissues was an independent prognostic indicator of OS but not DFS. The multivariate Cox proportional hazard models shown that combination of these two group supports the result that hsa_circ_0001946 was a promising and independent prognostic biomarker for ESCC patients in both frozen and FFPE tissues. And then, we used FISH for semi-quantitation and location of hsa_circ_0001946. As Additional file 9: Figure S5d showed, hsa_circ_0001946 locates in the cytoplasm. The above 100 patients’ FFPE tissues were conducted FISH analysis to explore the potential predictive performance for prognosis. The results (Fig. 2d, Fig. 2h and Additional file 10: Table S5) showed that expression of hsa_circ_0001946 by FISH was associated with DFS and OS and an independent prognostic factor. Increasing studies have revealed the sponge role of circRNA to miRNA by a conserved seed sequence. We also conducted miRNA microarray in the same ESCC frozen samples and performed coexpression analysis (Additional file 11: Figure S6a). The result was conjoint with predicted miRNAs bond to hsa_circ_0001946 based on miRanda and miRNA-7-5P stood out from the crowd. Then we make target prediction of miRNA-7-5p by starBase and 1597 targeted mRNA were found. We picked 6 genes which were positive in all 5 algorithms (TargetScan, PicTar, RNA22, PITA and miRanda). As it was shown in Additional file 11: Figure S6b. Finally, we performed GO and KEGG analysis as well as miRNA cluster analysis by DIANA tool (Additional file 11: Figure S6c and Figure S6d). We next explored the role of hsa_circ_0001946 in pathogenic mechanism of ESCC in vitro. Firstly, stable cell line overexpressing hsa_circ_0001946 was built by lentiviral transduction into Eca-109, TE-1, K-30, K-50 and named Eca-109-V, TE-1-V, K-30-V, K-50-V while the control cell lines were named Eca-109-NC, TE-1-NC, K-30-NC, K-50-NC. The lentiviral transduction elevated hsa_circ_0001946 expression a lot in these cell lines (Fig. 3a). MTT assay showed that hsa_circ_0001946 overexpression significantly decreased the proliferation of Eca109 (Fig. 3b). 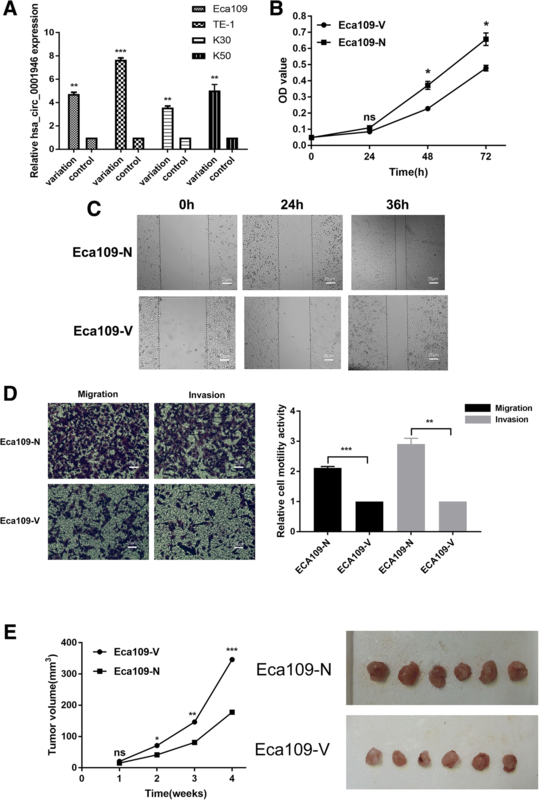 Wound-healing assay exhibited that hsa_circ_0001946 overexpression excessively decreased the migration of Eca109 (Fig. 3c). Transwell assay with or without Matrigel revealed that hsa_circ_0001946 overexpression meaningfully decreased the migration and invasion of these Eca109 (Fig. 3d). Moreover, in vivo experiment showed that hsa_circ_0001946 overexpression significantly decreased the proliferation of Eca109 (Fig. 3e) and TE-1 but not K30(Additional file 12: Figure S7e). The results also showed that hsa_circ_0001946 overexpression significantly decreased the proliferation, migration, and invasion of TE-1, K-30, K-50 (Additional file 12: Figure S7). In conclusion, our study reveals the roles of circRNAs in ESCC. 2 circRNAs had shown the potentials as blood biomarkers for ESCC. 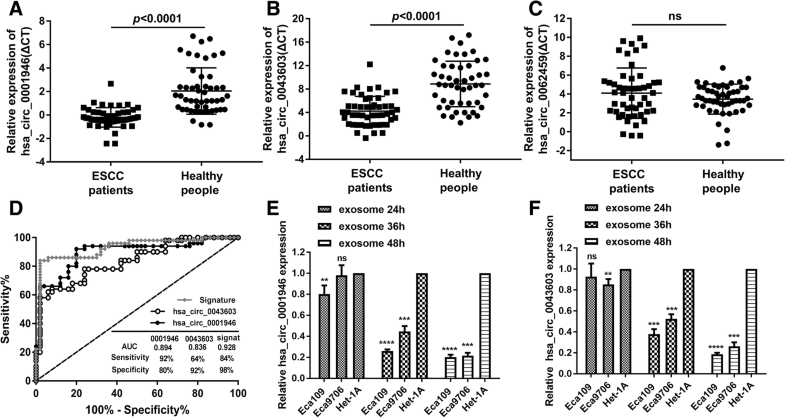 Hsa_circ_0001946 exhibited promising potency to be a prognostic biomarker and play roles in oncogenesis development of ESCC. However, based on these findings, further validation and underlying mechanism are still in request. This study received financial support from The National Key Research and Development Plan (no.2016YFC0105100). The datasets obtained and/or analyzed during the current study were available from the corresponding authors in a reasonable request. BSL, LYF, and QC designed the study. JL and LYF collected data and performed the experiment. QC and JPZ did statistical analysis. LYF and QC wrote the draft. All authors read and approved the final manuscript. The human cancer tissues and blood used in this study were approved by the institutional ethical committee of Shandong Cancer Hospital affiliated to Shandong University (Approval Number: SDTHEC201312051). We have received consents from individual patients who have participated in this study. The consent forms will be provided upon request.